In this project we are going to design an 8x8 LED matrix display, for that we are going to interface an 8x8 LED matrix module with Arduino Uno. An 8x8 LED matrix contains 64 LEDs (Light Emitting Diodes) which are arranged in the form of a matrix, hence the name LED matrix. These matrixes can be made by circuiting 64 LEDs, however that process is time consuming. Now a day they are available in compact forms as shown in below image. These compact modules are available in different sizes and many colors. The cost of module is same as cost of 64 LEDs, so for hobbyists this is easiest to work on. The bare LED matrix has 16 pin outs with 8 common positive and another 8 common negative. For connecting this matrix directly to a UNO, we need to spare 16 pins on the UNO. With the output pins low on UNO, we cannot spare 16 PINS. So we need to connect this matrix to a driver chip. This driver chip along with matrix comes as a set which is shown in below figure. The connections which are done between Arduino Uno and LED matrix module is shown in below table. The circuit diagram of 8*8 LED matrix display is shown in below figure. Now for using the special futures called by installing new library, we need to establish few commands in program and are stated below. First we need to call the header file for interfacing a LED matrix to Arduino Uno. That is” #include "LedControlMS.h"”, this header file call the library special functions. We have a feature with these modules we can connect many number of modules in series and program them together as a single display. This feature comes in handy when we need a display unit which could display multiple characters at a time. So we need to tell the controller how many displays we are connecting. In this module there are mainly three pins; data flow from UNO to module takes places with these three pins. The pins are DATAIN (data receiving pin), CLOCK (clock pin), and CHIPSELECT (command receiving pin). Now we need to tell the UNO where we are connecting these pins. This is done by command “LedControl lc=LedControl(4,3,2, NBR_MTX); ”. “lc.writeString(0,"CIRCUITDIGEST");”, this command is used for telling UNO which characters are to be displayed on the LED matrix. With the above the display shows” CIRCUITDIGEST”, with each character once. We need to clear the display chip memory before sending any other data, this is done by command ” lc.clearAll();". 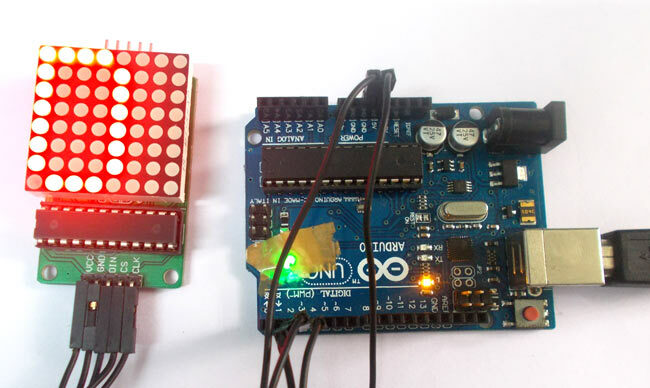 By this way we can easily interface a 8x8 LED matrix to Arduino Uno.